Highlighting a few of my favorite stops: My first stop was with Alyssa and Adam of Patchwork Homestead on Garren Creek Road. As my AmeriCorps Project Conserve service with OGS winds down, I have a lot of fond memories of the food and farm folk I’ve met in the last eleven months. There are few things more exciting to me in this work than meeting the people that are living their passion for growing food in sustainable ways. One such opportunity was the Gardens of Fairview Tour in June. 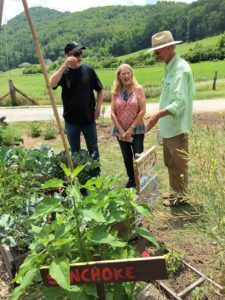 Concerned about the rising numbers of WNC residents for whom hunger is a serious issue, Jim Smith organized the tour initially to get a sense of how many people in his area grow food. In its second year, some property owners reported a doubling of visitors, and the tour has grown beyond a focus on food security to include arts and crafts as well as presentations on community gardening, attracting butterflies, caring for bees, green building and permaculture, and year-round gardening. It’s a shared vision creating community around food and the places in which people grow it. Juxtaposed to the homemade back-to-the-earthiness of Patchwork, Bear and Butterfly Homestead presents a more manicured aesthetic to suit purposes apart from homesteading as most of us know it. Alyssa is as expressive with her gardening as she is with her artwork. She creates paper from plants and has begun experimenting with utilizing branches to weave borders and grow fences. Adam plays the banjo and installed the solar panels that provide hot water for their home. 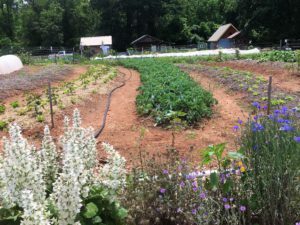 The homestead is a patchwork of diverse projects from growing food for sale and sustenance, herbs for medicine and flowers that support pollinators, to a meditation dome constructed of living willow…also valued for the growth hormone it contains. The large greenhouse supports ginger, turmeric and ashwagandha production to help supplement this creative couple’s income. Sam and Shane built an estate on Morgan Hill Road from the ground up, where there were only woods at purchase — saving the trees in their process. Collectors of art, there were a lot of fun sculptural pieces to look at, my favorite and theirs being the birdhouse collection and their inhabitants. They also own a butterfly sanctuary in Key West with experience in breeding butterflies that they love to share. The entire property is grown organically, weeded by hand on a daily basis, and has just opened as an exclusive retreat for gay men. Food production is currently limited to what the two of them need — with some tasty morsels finding their way into the chicken condo. 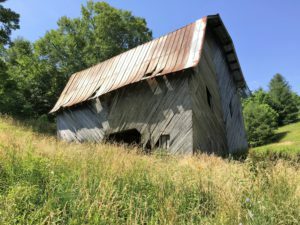 Despite my unfamiliarity with a setting like this as homesteading, my take-away was the number of ways in which homesteaders put together a living, and — grow more milkweed! My next stop was the Spring Mountain Community Garden on Old Fort Road, a tour of which was hosted by Jim Smith. 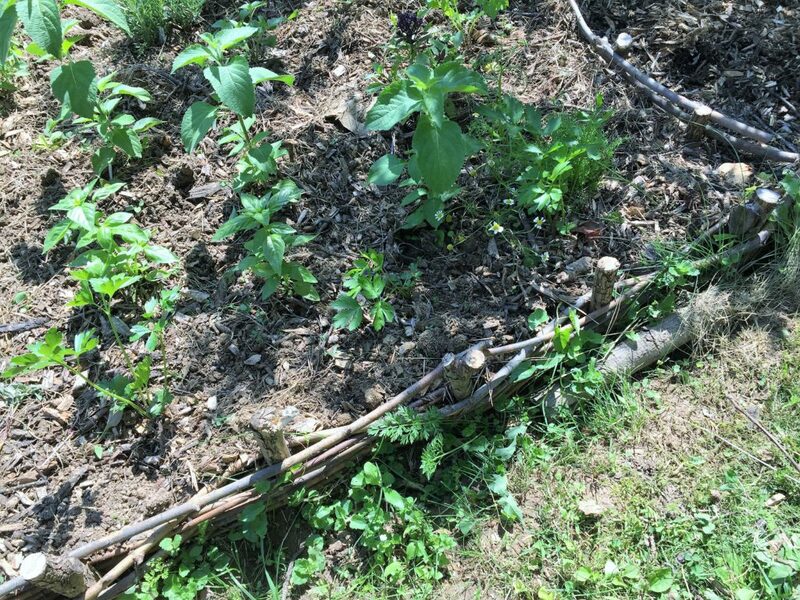 Following last year’s garden tour, Jim was granted permission to create a small educational garden at a community center with two kitchens that might soon provide space for food prep and preservation. This year, plans have been drawn up to utilize the lot next door to the center for use by community members. Jim was a wealth of information, as one might expect from one of the founders of Organic Growers School. This is where Jim puts energy into his focus on food security and the kind of community that creates that. In addition to crop species and interpretive signage, Jim is also incorporating nutritionally useful natives in the garden and programming this year. Onward. I next visited Roger and Marvin at Windsong Garden and Farm on Old Farm Road, another example of the transformation that can come of a guiding vision. 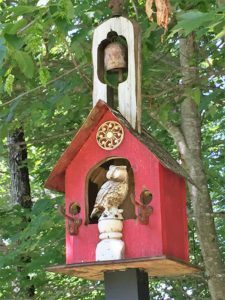 Although this property is also an estate by my reckoning (featuring Roger’s metal sculptures), it also incorporates a renovated cabin and a ram pump that moves water from a creek to the vegetable gardens. 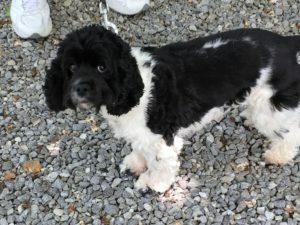 The gardens produce organic food for the couple and guests, as well as their Springer Spaniel, Molly. Found hungry, she had taken to foraging and can mow down a row of tatsoi in ten minutes! That was on Saturday, June 10. Sunday morning, I was at it again. I went out to Lord’s Acre, a “garden that gives” and poked around while waiting for an “All About Bees” presentation to begin. Wow, what an amazing operation! Staffed the day before, there was no one around, but it was pretty clear that they are pulling thousands of pounds of produce out of this garden every year. It’s also an educational facility, one that Jim Smith looks to as a model for the community center. There are interpretive materials available even when they are closed, and signage indicates a number of growing methods they are experimenting with and teaching: hugelkultur, African keyhole, straw bale and so forth. And with flowers planted all around the space, there was no shortage of pollinators to support the growing of produce. The pièce de résistance was a demo at Lord’s Acre entitled “All About Bees”…that no one attended! I wondered if Saturday was such a full day that Sunday wasn’t appealing, or if the concurrently-scheduled butterfly presentation (and free chrysalis’) at Bear and Butterfly were the issue. But the Buncombe County Bee Club didn’t care either way, as they were set up to certify new beekeepers in any case. 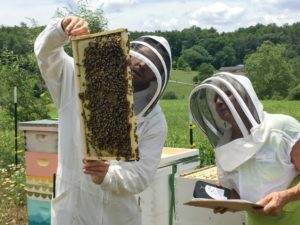 BCBC certifies more beekeepers than any other club in the state. I learned a lot about keeping bees, but most especially, the dedication it takes to take that on. Thinking about the efforts of each and every bee, and the beekeepers that care for them, I can’t imagine ever taking a jar of honey for granted. Asheville is ripe (right?!) with farm and garden tours, and yet, I’d like to see more. I think they can appeal to particular audiences and teach more: herb garden tours, beekeeping tours, permaculture tours. There is so much to learn, and confining garden tours to neighborhoods, while fun to be a part of, spreads the bread a little thin in terms of educational content. Another one of the things I find really exciting? An experience that engenders action! My successor with AmeriCorps Project Conserve is Katie Schroeder. She will be available as of September to advise on organizing garden tours of all types as a function of the OGS Home-Growers Program. Let’s all get growing!